I’m glad that Kogyoku (Jonathan) apples are becoming popular around here recently. Now I know two supermarkets in my neighborhood where I can buy Kogyoku apples throughout the apple season. I used to envy those who can get granny smith for making apple desserts, but Kogyoku apples here are said to be a decent substitute. 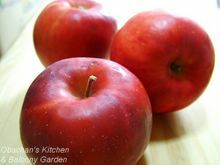 When I thought about making jam with these sour apples, an idea popped up in my mind. What if I use the skin, too? Would that make the jam red, or at least pink? So I googled, and found that quite many women in Japan thought the same thing. 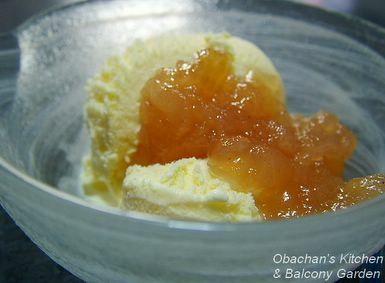 I found a Japanese website with appetizing photos of apple jam with red spots (the skin) showing here and there. I thought that the jam would look lovely with ice cream or yogurt. So I tried it out, with the amount of sugar being 25% of the weight of the Kogyoku apples. While in the pot, my jam looked pretty close to the jam on the Japanese website mentioned above, but after canning, mine turned darker orange. Mmmm.... And the color seems to be getting darker with time. The difference is: I used spices, like cinnamon and nutmeg, and I also added a little amount of pectin at the end, which was probably unnecessary. 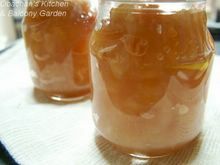 Though not too happy with the color, I like the taste of this jam very much -- I found the texture of the skin rather pleasant. But I’m not too crazy about the combination of this jam and buttered toast. I think it may not turn brownish if you add a little lemon juice to it. It doesn't really matter taste-wise but if the color matters, you might give it a go next time. I saw some apple jam in our local Japanese grocery store the other day. I should probably try it out. It might work really well as a pancake or crepe filling.